Reach for the glass and pour yourself a few ounces: Red wine may actually be good for the hearts of type-2 diabetes patients. That’s what a new small, short-term study seemed to suggest. Resveratrol, an antioxidant and natural compound in red wine and red grape skins, was found to reduce arterial stiffness and improve the health of blood vessels, reported the DailyMail.co.uk. For the purpose of their study, the researchers enlisted the aid of 57 type-2 diabetes patients with an average age of 56, as well as an average rating of “obese” based on body mass index (BMI) calculations. The researchers utilized the carotid-femoral pulse wave velocity (CFPWV) test to measure the stiffness of each patient’s aorta, which is the body’s largest artery. Patients were then given a daily dosage of 100 mg of resveratrol over the course of two weeks. The dosage was then bumped up to 300 mg a day for another two weeks. Finally, the patients were given polyphenol-free placebo for four weeks afterwards. Additionally, the patients were tested on their blood vessels’ ability to relax and expand as needed, which was noted as an indicator of good blood vessel function. In the overall study group, the researchers found that the resveratrol treatment reduced aortic stiffness, however the reduction was not statistically significant. The results were more positive in a subset of 23 patients who had high arterial stiffness at the beginning of the study. The 300 mg dosage of resveratrol reduced aortic stiffness by 9.1 percent, the 100 mg dosage lowered it by 4.8 percent, while the placebo treatments increased arterial stiffness. These were the findings presented at the American Heart Association’s Arteriosclerosis, Thrombosis and Vascular Biology/Peripheral Vascular Disease 2017 Scientific Sessions in Minnesota. “This adds to emerging evidence that there may be interventions that may reverse the blood vessel abnormalities that occur with aging and are more pronounced in people with Type 2 diabetes and obesity,” senior study author Dr. Naomi M. Hamburg stated. According to MedicalDaily.com, SIRT1 is a gene that slows down the premature aging of the arteries, thereby reducing stiffness of the aorta. Among animals, the gene delays aging as well as the development of several diseases. Due to the promising results, the researchers have agreed that their findings warrant further investigation. “The changes in this small and short-term study are not proof. Studies with longer treatment are needed to test the effects of a daily resveratrol supplement on vascular function,” remarked Ji-Yao Ella Zhang. Learn more about any breakthroughs or further developments about diabetes by visiting DiabetesScienceNews.com. In addition to red wine and red grape skins, resveratrol can also be found in peanuts, blueberries, and Japanese knotweed. Red wine contains more resveratrol than white wine because white wines are fermented without the grape skins. 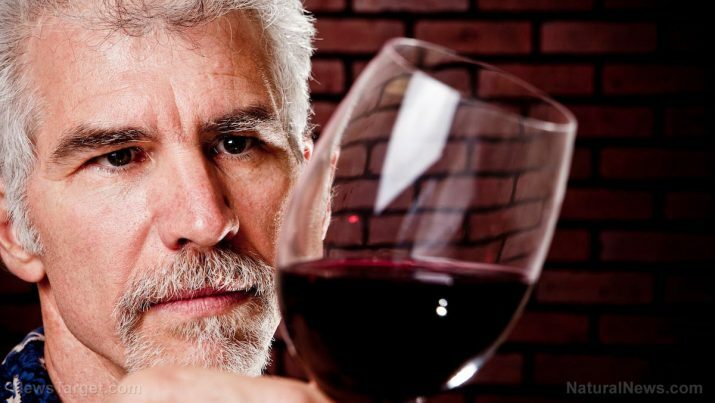 Every eight ounces of red wine are said to contain less than one mg to two mg of resveratrol. The skins of grapes produce a large amount of resveratrol to protect the plant against sun damage and fungal diseases.